Just when I thought I was almost out of new outfits to model, I found this pretty pink frock that I forgot I had! My favorite parts of the dress are the fancy pink rosettes on the bodice and the flouncy skirt. Flouncy is a funny word. And must to make it even fancier, I added this matching pink bow! Modeling pretty fashions makes me feel happy! I hope you all have a happy Friday! You are ever so lovely as always my dear. Very pretty! We like your flouncy skirt too. Looks like you're ready for a party. I love that bow! Actually, I love chewing on bows like that. Which is why I rarely get to wear them. You are a pretty picture in pink tonight miss D.
Okay, the dress is sweet but the bow just sent it to 11. * Most things go to ten, but this goes to 11, see. You look very pretty in that dress Daisy! I love your flouncy dress, Daisy. Have a great Friday. Always a purrfect 10, Daisy. You are so great at modeling and so pretty in pink. Have a beautiful weekend. Oh my goodness Daisy..you are stunning in that low cut pink frock. The roses make it pop! That bow..ooo la laaaa. What a supermodel. Oh Daisy that pink outfit is just the best. We also think the pink bow is a great addition. You always put a smile on our Mom's face and that makes us feel good. Take care and have a great week end. you look very beautiful, and also the mom says you look very 50's with the scarf! Stunnin, absolootly stunning dear Daisy! Daisy, you look pretty in everything you wear! That is a beautiful frock, Miss Daisy. You are a pink princess! That bow really adds a lovely touch to the outfit, Daisy! We love your flouncy skirt. You look extra pretty in that last photo. You look gorgeous in you pink dress - we love the flowers round the top and how the skirt flouces when you move. Daisy, you look gorgeous! The last picture of you made Mama all SQUEE-y. 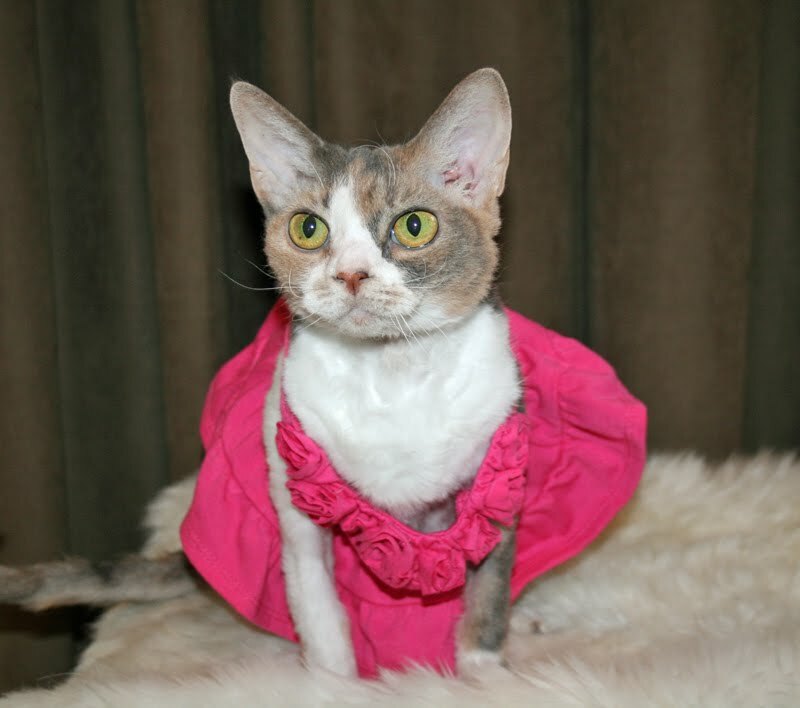 Since pink is my very favoritest color, I almost swooned when saw your new dress. Your fancy neck bow really completes the outfit. The pink bow is the best! You look gorgeous and the pink rosettes are adorable. Daisy, another winner! Did you find that pretty dress when you did your laundry this week? Did you find it when you did your laundry? You are a vision in pink! Dat is a beyootiful gown, Daisy, yoo always look so lovely. If we wore clothes, which we will never do, we'd want yoo to advise us on what to wear. daisy, this is a very pretty color on you and the dress is very lovely! Hot pink for a hot kitty! Ooh-la-la! That dress is rather revealing -- especially in the last picture. I think you need some underwears with it. 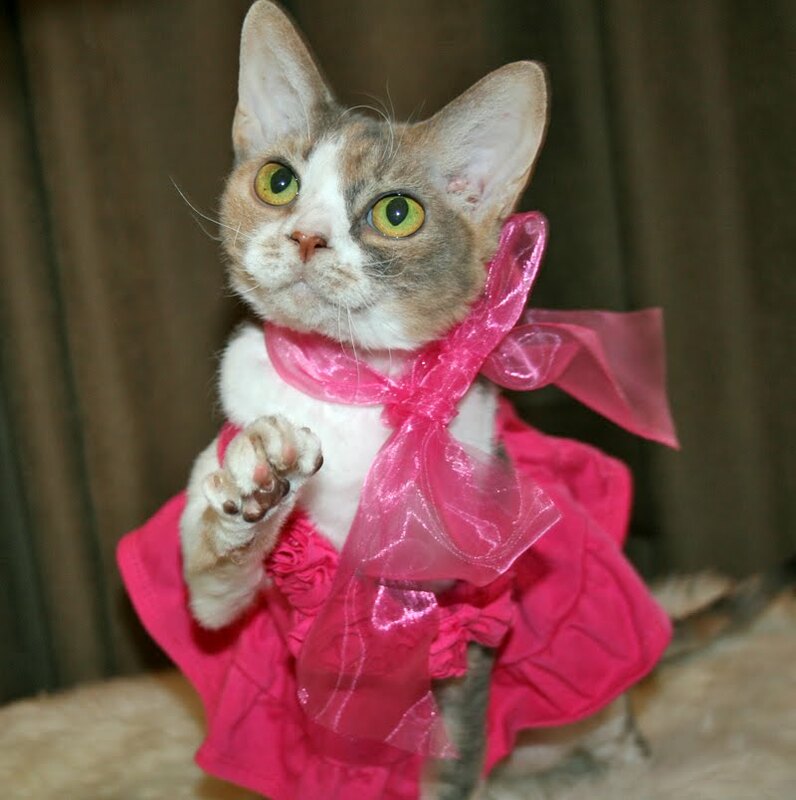 The bow is certainly a wonderful accessory and matches the outfit PURRfectly! We think pink is definitely your color. We like your new dress, with or without the scarf. We can see you are happy. You have a very big smile. Daisy we love how you can take an ordinary outfit and make it extraordinary! And we think the flounce is cute! 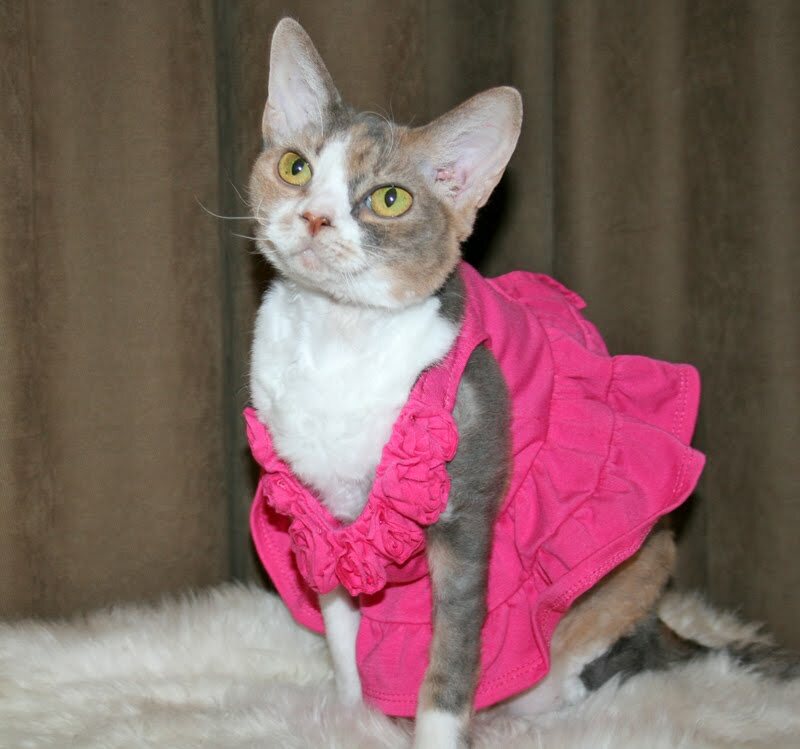 Daisy you look very pretty in your pink dress! The bow is a nice addition too. The pretty pink bow really looks good with the flouncy skirt. Yes, "flouncy" IS a funny werd! Daisy, you are the ultimate fashionista diva. You are just gorgeous in that outfit. Pink is your color. Seeing you model makes us happy, Daisy! That flouncy dress is very pretty!! I love the details on your dress. Daisy, yoo look absolutely purrfect in pink! We hope yoo all have a lovely weekend. Smoochies. you are always soooo pretty in pink. isn't it amazing how "we" fashionistas lose track of all the pretty outfits we have. oh, a girl's life. gotta love it! Happy weekend to you Daisy. You look very pretty in pink. Daisy! You are Beautiful! Your pretty frock makes me smile and feel better. Thank you for posting those lovely pictures of yourself. Pink sure is pretty when you wears it. You look delightfully pawsome, as usual! Oh, Daisy, you just made my weekend with your pretty pink frock and big smile! Lovely! The bow really sets up the outfit. Andrew McCarthy's at the door for you. Something about prom? 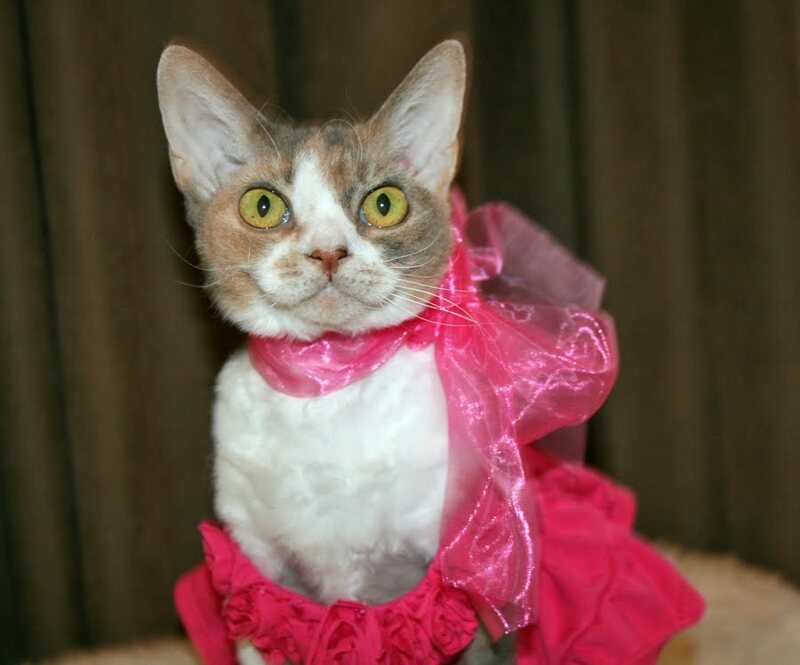 You look very pretty in your lovely pink dress. You look real purty in your pink dress with those spiffy rosettes, but I think I like you better naked! Oops, I'm so naughty! I can't get enough of pictures of cats of EVERY kind. You make it SO interesting with your beautiful outfits. Daisy, you never fail to charm! You look delightful and pretty but still very much you, Daisy the Curly Cat. You look as if you are ready to go dancing. Perhaps Harley and you should watch Dancing With The Stars. P.S. Our niece is expecting her baby girl and yesterday was the date. She might be shy, so please pray good meow prayers for her safe and happy delivery. Thanks! Aw, Daisy, Pink suits you! I LOVE your smile in the last shot! yoo are just darlin Daisy.